Nigeria's Senate President Bukola Saraki said on Monday that the former Governor of Lagos State, Senator Bola Ahmed Tinubu’s comments on Sunday indicating that he (Saraki) left the ruling party because of the fear of automatic tickets were driven by self-centered ambition. He said: “I have always restrained from joining issues in the media with Asiwaju Bola Ahmed Tinubu and this is based on my respect for him. However, I will not allow him to create a wrong, false and mischievous impression about the reasons for my decision to exit the All Progressives Congress (APC) and present his prejudice as facts for public consumption. “I have been consistent in my complaints to all leaders of the APC, including Tinubu, that a situation where the National Assembly is not constructively engaged or carried along in key policy decisions, particularly those that will eventually require legislative approval, is not in the best interest of the nation. No genuine leader of the legislature will be comfortable that the Presidency will simply write a terse letter to the National Assembly on key issues which the federal legislature is expected to later deliberate upon and give its approval. 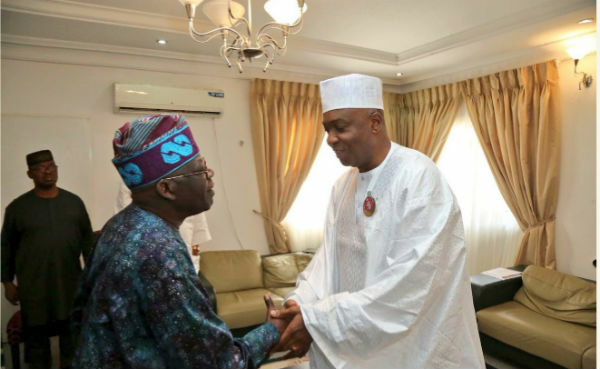 He added that while his own decision was based on “protecting the collective national interest,” Tinubu had decided to live with the identified inadequacies of the government so as to achieve his 2023 presidential ambition. “It should be noted that he has not forgotten the fact that I took the bull by the horns and told him that in the interest of the country, he should accept the need for the party to present a balanced ticket for the 2015 General Elections in terms of religion and geopolitical zones. “Since that time he has been very active; plotting at every point to undermine me, both within and outside the National Assembly,” the Senate President stated. He further stated: “It should be known that Democracy is a system that allows people to freely make their choices. It is my choice that I have decided to join others to present a viable alternative platform for Nigerians in the coming elections.